The second annual Women’s March in Manhattan in January. The partisan struggle over abortion has been an enduring feature of American politics. But the parties have not prioritized it equally — the issue has consistently animated Republican voters more than Democrats. Two new surveys, however, reveal a remarkable shift in how important the issue of abortion is to Democrats and Republicans ahead of the 2018 midterm election. First, a recent PRRI survey found that nearly half (47 percent) of Democrats said abortion is a critically important issue to them personally; 40 percent of Republicans said the same. That represents a dramatic swing since 2015, when 36 percent of Democrats and 43 percent of Republicans said abortion was a critical concern. 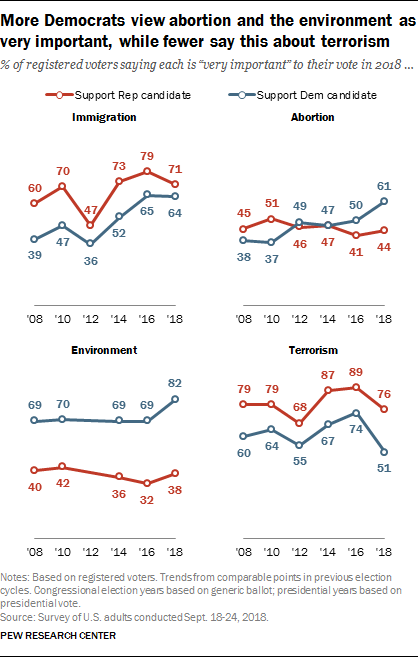 Democrats are almost twice as likely today to rate the issue as critical as they were in 2011. Democrats are also increasingly likely to say abortion is an important votingissue. A recent Pew poll showed that abortion is a far more central voting concern for Democrats today than it has been at any point in the last decade — 61 percent of Democratic voters said abortion is very important to their vote this year. In 2008, only 38 percent of Democratic voters said the same. That’s roughly the same percentage of Democratic voters who say terrorism, taxes, immigration, the federal budget deficit or trade policy is an important voting issue. Why do Democrats care more about abortion now? The most obvious answer is that the right appears imperiled in a way that it hasn’t been in recent years. Even before Justice Anthony Kennedy announced his retirement in June, Democrats were expressing concerns about whether abortion could become illegal in the U.S. More than 4 in 10 Democrats, including 45 percent of Democratic women, said it was at least somewhat likely that abortion would become completely illegal within their lifetime, according to a March PRRI poll. Another likely reason for the rising concern among Democrats is the years-long campaign to curb abortion access at the state level. 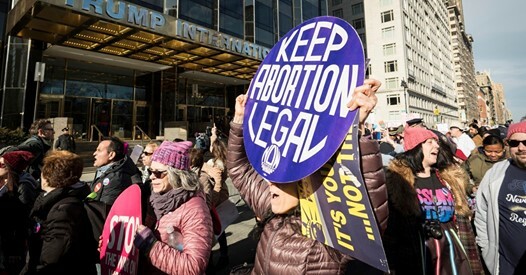 Access to abortion has been systematically curtailed for nearly a decade as Republican-controlled legislatures have introduced restrictions on when, where and how an abortion can be provided, which has resulted in the shuttering of clinics that provide abortion services. From a high of 2,900 in 1982, the number of abortion providers in the U.S. has dropped to 1,671 as of 2014, according to the Guttmacher Institute. Between 2010 and 2016, more than 300 state-level restrictions on abortion access have been enacted. There is a growing perception among Democrats that abortion is becoming less available. Nearly half (45 percent) of Democrats said it is somewhat or very difficult to get an abortion in their community, according to a PRRI pollconducted earlier this year, while only about one-third (34 percent) expressed that view in 2011. With all that said, polls show that when most Democrats make voting decisions, they still weigh the issue against a diverse constellation of competing concerns, such as other health care issues and the environment. It is not a litmus-test issue for most Republican or Democratic voters. Only 21 percent of Republicans and 30 percent of Democrats say they would only ever support a candidate whose views on abortion align with their own, according to a PRRI poll. Even among Democratic women, only about one-third (35 percent) say they would only vote for a candidate who shares their views on the issue. At the same time, more Democrats report that the issue is a deal breaker for them than did so just a few months earlier, when only 22 percent expressed this view. Whatever the immediate political fallout from the 2018 election, Democrats are likely to continue to prioritize the issue of abortion so long as its legal status appears to be threatened and access is limited. In the short term, this may mean that fewer Republicans campaign on their uncompromising opposition to abortion. Conservative Christians, a group that has worked for decades to overturn Roe v. Wade, have been conspicuously tight-lipped about abortion in recent months — an indication that they are worried about the possible political fallout of discussing their views. The 2018 election will tell us if that strategy comes too late and the abortion issue has given Democratic voters an additional reason to head to the polls.